Hello everyone; yes, once again it is I, Chess the purebred border collie, here to bring you the latest and most exciting news from our garden. You may remember me from such posts as “Making A List” (where the guy I live with made me wear a red bandana), and “Season’s Greetings”, my last post, where I had to wear antlers and look like a fool. Here I am in a characteristically jovial pose, since I’m not wearing antlers. I’m not really in focus, either, but it’s the no-antlers look that I’m really proud of. There really isn’t anything much to say about today, as usual, because hardly anything happened. The guy I live with spent a lot of time out on the patio, sawing and nailing. He made a box. 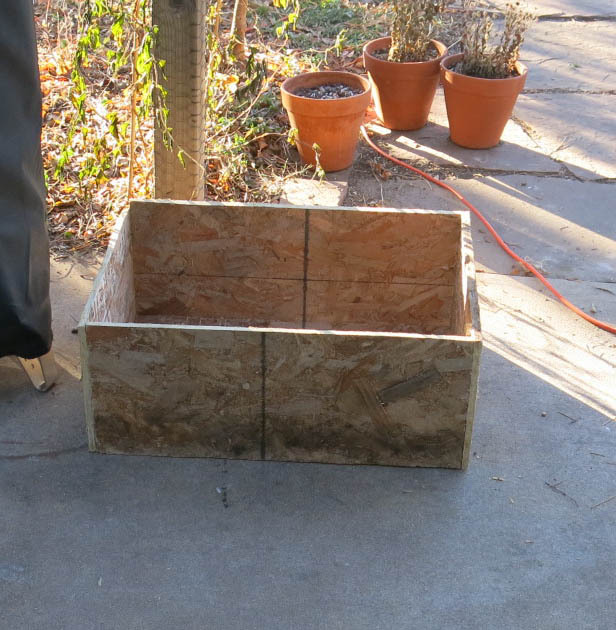 It took him an awfully long time to make this box, but he said that the particle board was really old and something else (I stopped listening right about then), but what this is, in case you were wondering, is a mold for troughs. He gave away the one that my mommy made for him (he’s not sure why he did that, but he’s done a lot of things he’s not sure why he did), and so today he made another one. He says he still has to make the inner mold, and maybe he’ll do that tomorrow. That will be exciting, I’m sure. We definitely are right on the cutting edge, if you’ll pardon the pun, of excitement here. In fact, just look at what he got as a Christmas present. If you’re thinking this is a bucket, you would be exactly right. He got a bucket for Christmas. He said maybe we shouldn’t show this, because so many people would be jealous, but somehow I think it’ll be okay. 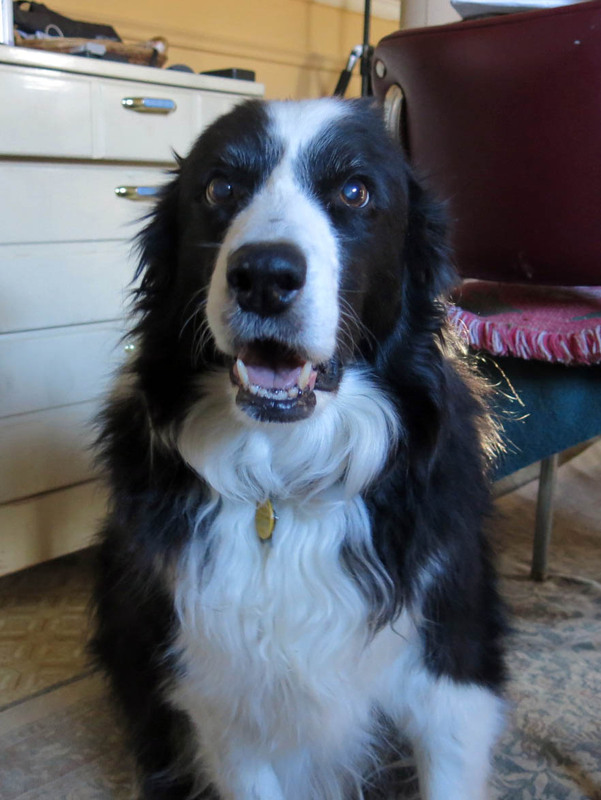 It’s true that not everyone has a bucket, but then, not everyone gets to live with a purebred border collie, either. Oh, there is one thing that he said was pretty interesting. Out of curiosity he went into the shade garden (on the north side of the house) to look at things, the way he does sometimes, and lo and behold, there were snowdrops coming up. It isn’t like winter is over or anything, but at least now the guy I live with has something to talk about. So long as he doesn’t talk to me about it, things will be fine. That’s really all for today. The main thing, here, was to show me without antlers. I did that, and so now I’ll say goodbye. I have a bucket just like that one (well, black) – BEST bucket ever! I used to love the thin wooden bushel baskets with wire handles, you could leave weeds in them in the meadow and even if it rained they wouldn’t fill up with water. You could come back later to the chore, like if you got distracted or something. Even though this new bucket doesn’t drain, it’s so easy to carry around that you just clean up and toss stuff and then put it away. Hmmm…nothing like finishing what you started. The guy I live with does say you can’t have too many buckets. I know he’s not talking directly to me when he says this, because I don’t have any. He has paint buckets, metal buckets, dish pans, and now this new one. Chess in antlers has its merits – for onlookers – but the jovial pose is our known and well-loved Chess. Another splendid portrait. Hmm, a bucket. I was promised a plant sprayer in a Christmas IOU, so nothing odd about a bucket. Is this one sturdy? I have had one or two buckets which beguiled by their looks but really could not carry weight. At any rate, Bucket Green is a great green. Should serve as well as bright orange for not being lost in the garden. Very cleanly-made trough mold, the person you live with does good work. The boxes displayed about a week back looked well-made too, and I was impressed. He also does say that you can lose anything in the garden, even if it’s painted red and has flashing lights attached. What a happy Chess you are today sans antlers, keep smiling. Very nice, blend into the garden almost, bucket. It looks like a trug we use, which comes in all different sizes and is made from a rubbery material instead of plastic, better than a regular bucket, very versatile, I know your guy will enjoy it, good that he’s happy. I need a deep breath, that must be the longest sentence ever typed by me. 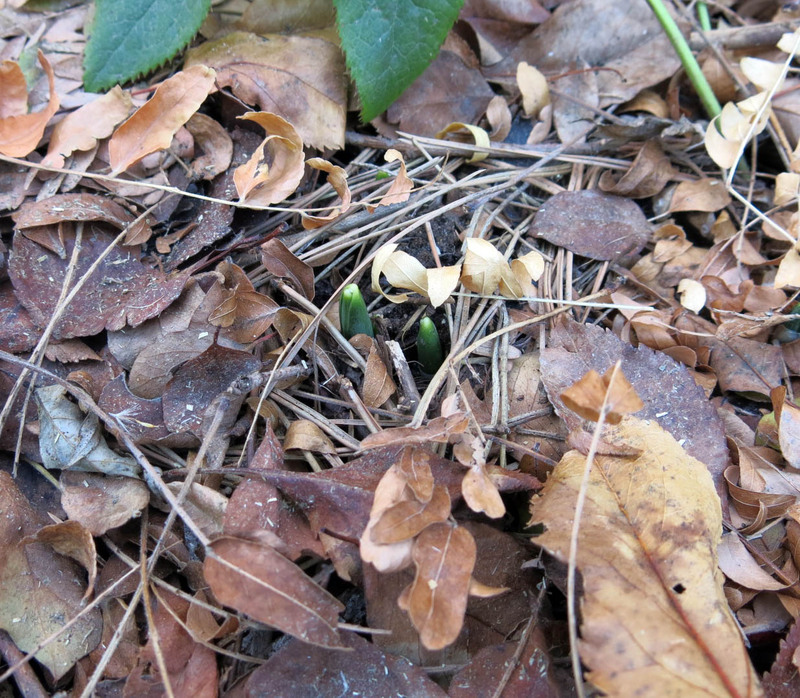 I like the idea of snowdrops coming but aren’t they way too early. Looks like a nice day today for a happy dog, did you have your walk and biscuit? It isn’t too early for snowdrops here. Maybe back east, but not here. They’re a January-February thing here. Usually. Winters lately have been so icky that anything is possible now. The green bucket is a “tubtrug”; he also has a real trug, a Sussex trug, which he bought because he thought it might make help plants grow better. Two walks, as usual, with lots of sniffing detours, and more than one biscuit. We used to get only a few biscuits, but things changed, and now I get a lot. He buys my biscuits at the health food store, too. This entry made me happy before I even read it — because the title said so much. And then there was the bucket — I was just thinking earlier today that I never have enough buckets. I keep trying to have a ‘good’ bucket, one that’s not crudded up by gardening, so I can use it for mopping water; but no matter how determined I am to keep one of them pristine, they all inevitably are used for weeds, or gravel, or soil (potting or otherwise). I take that as a sign I shouldn’t be mopping. But, still. A different kind of bucket list, I guess. The guy I live with claims that the title just occurred to him, and that I should use it, because he thought it was funny. I just thought it was about time. All of the buckets here have lost their pristine quality. There was one just used for filling the turtle tank, but the turtle is gone now. The buckets are excellent for soaking root balls, since most of those have peat moss in them, which is almost impossible to re-wet once it’s dried out, and a dried-out root ball is probably the main cause of plant death here. Funny thing. One really windy day, the guy I live with says he turned into the neighborhood coming home from work, and there was a very familiar looking bucket rolling around in the street. He knew it was his, because it had been filled with coffee grounds, which he uses as a soil amendment. “Helps to wake up the plants in spring”, he says. The bucket had been blown uphill, and then downhill, for a distance of about ten blocks. The blowing bucket story reminds me of another windy day/gardening story. I grew up about 1-1/2 blocks from Gaar’s tree nursery & my dad still lives in that house (the back yard of which literally ends in a corn/soy bean field). The nursery always had scads of large black pots stacked outside against the building. Years ago (when I was living in Flint), I decided I needed one of those big (5 gal.?) pots for some reason (don’t remember what I intended to grow in it), so I asked my dad if he would ask Mr. Gaar for a couple of pots. My dad asked, and he said Mr. Gaar said no (and dad had several choice words to say about Mr. Gaar). A week or so later, my dad called to say he had several pots for me, if I still wanted them. I asked him if Mr. Gaar had changed his mind. He said no, that the wind had blown a bunch of the pots into the field behind his house, so he just went out and retrieved them. Pottetic justice, I would say. 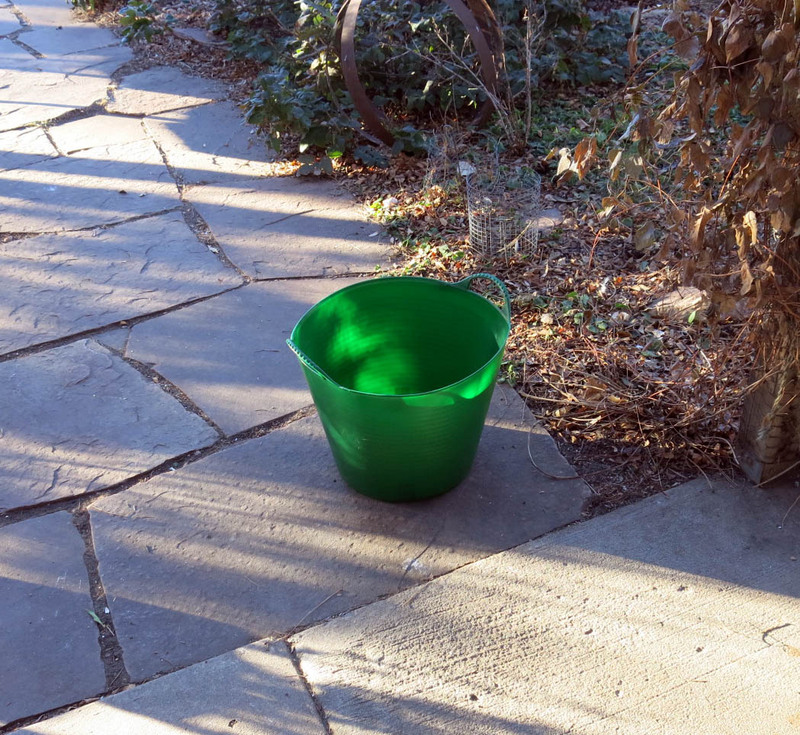 This is no ordinary bucket, it is a vital piece of gardening equipment. The man in the shop where I bought mine called it a ‘gorilla bucket’, though what gorillas have to do with I can’t imagine. Maybe “gorilla” hints at extra strength and endurance, unless there’s something about gorillas we don’t know …..